As three month old Jack lies under his play gym, he makes all sorts of connections in his brain, wiring it for intelligence, fine motor skills and communication. We know that it is important to stimulate our babies and that more brain development happens in the first three years of life than at any other stage. For this reason there is pressure on us, as parents, to buy the best toys for our babies and provide them with the opportunities to learn from their environment. Toys are one of the best tools we use but often they just end up in a pile in the corner of the playroom and no one benefits from them at all. Antoinette Scandling, special education teacher and mother has some good ideas on how to maximize the potential toys bring to stimulation. The first thing I like to do both in my classroom and with my son’s toys at home is to arrange them into categories. Have separate boxes for different types of toys: puzzles and games, wheel toys, soft toys, imaginative play, manipulation toys, noisy toys etc. This way you can always quickly find what you are looking for, or replace stray pieces that you may find after packing a particular toy away. This helps you feel organised and a little in control of things, especially in the early days. Secondly, it is a good idea to have a small basket of toys in each room of the house where you find you spend most of your time in during the day, and try to make those toys relevant to the room, for example, keep a box of soft toys for the bedroom, a small basket of bath toys in the bathroom to explore whilst waiting for mum to put her make up on, or toys that make different noises for the kitchen. This helps your baby to understand that each room in the house has a different function. S stands for Soft area and Social Play – Put books out on the couch or a pile of pillows. This is where your baby can go to wind down or when he is feeling sleepy. You can also include some soft toys, blankets or security objects here. You can use this area to massage your baby, just have a cuddle, play soothing sounds or soft music. P stands for Physical development. 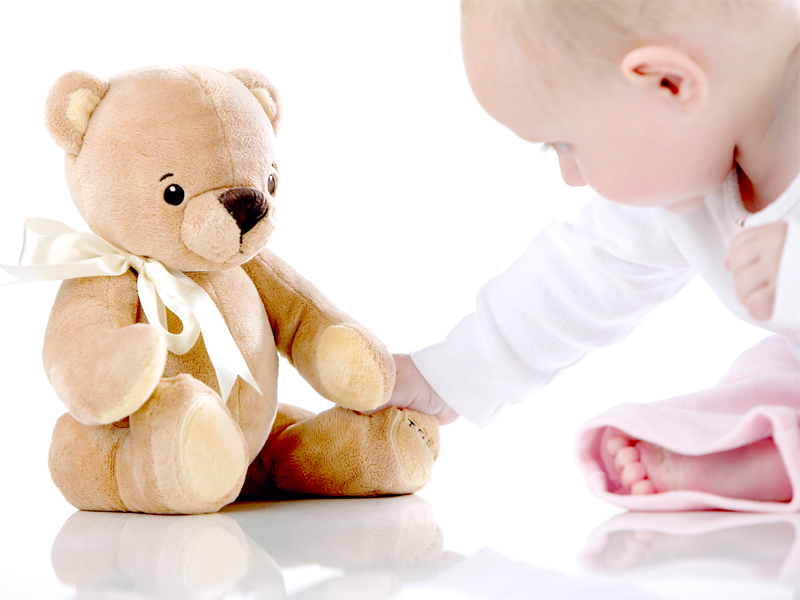 Here put out toys that enhance fine and/or gross motor skills, such as anything that your baby can manipulate and explore with their hands or for older babies things they can pull themselves up on, push and pull toys, balls and toys that encourage movement. A stands for Aesthetic. This is an area where baby can be creative. A tape recorder playing songs and rhymes. Explorative and tactile play with spaghetti, shaving foam, corn starch, finger paints (warning – extremely messy and must be very well supervised). Books and musical instruments also go well in this area, as well as fantasy play objects like dressing up clothes or play food. Even just putting out some of your clothes for your baby to explore is a good idea. Clothes can be put out in categories, such as all hats one day. It doesn’t matter that your baby can’t put them on yet and play around in them, just exploring them and interacting with you is enough to provide essential learning opportunities. C stands for Cognitive Development. This area is for puzzles, games, cause-and-effect toys i.e. push this button and something will happen, noisy toys, colours, shapes, numbers, bright pictures, and toys that might stimulate any of their 5 senses. For older babies simple construction toys, like large blocks or the big duplo. E is for Emotion Development. Here, put pictures of your child’s close family members or other babies that you see regularly. Mirrors are a great idea, but make sure that any mirrors are shatter proof and have safety glass. You can mix the soft play and emotional areas together as they can overlap somewhat. When your baby is young, 1 toy or activity for each area is enough. As he gets older, increase how many activities you offer your baby. This entry was posted in 6-12 Months, Baby, Development. Bookmark the permalink.